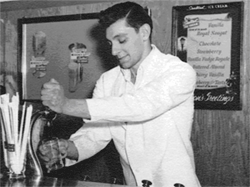 Back in 1955, Joe’s dad, Tony, opened a soda fountain next to his parents’ grocery store. Known as “The L” because of its L shaped building, “The L” served up a variety of soda fountain favorites like floats, milkshakes and classic fountain drinks. It is also where Joe’s parents met for the first time. 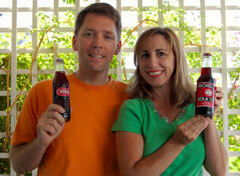 Joe and Debbie Giordano grew up drinking old fashioned sodas like Strawberry Nesbitts, Orange Crush, and Frostie’s Root beer. In search of vintage sodas, like the ones they grew up with, they started Epic Sodas in 2008 and embarked on a tasteful journey to find the best gourmet sodas found only in glass bottles. Today we are pleased to offer you over 80 varieties of old fashioned, glass bottled sodas! They make the perfect nostalgic gift for that hard to buy for person or a fun accompaniment to any party or BBQ. When you have a glass bottled soda in your hand, you are sure to start a conversation. So sip, relax, and enjoy!